Our Funnel cakes are perfect choice for any school, church or at home birthday party. Our funnel cakes are packaged frozen then cooked onsite in microwave or oven, to cook funnel cake through, the taste is just like your favorite carnival with out Renting a fryer or transporting 6 gallons of hot oil. Don't forget the toppings power sugar, chocolate, Carmel, fresh fruit, wipe cream etc. 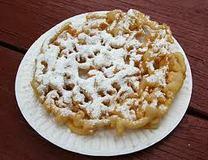 Most schools or church functions that give away funnel cakes cut it in quaters or half to increase the yeild.